Last spring,* I posted about my past experiences with musical theater (both the affection and the trauma of it), as well as the discernment process by which I considered whether or — as I ultimately decided — not to audition for a fall production. Ultimately, I decided that I was just way too likely to get caught up in all the ego-insecurity of the process for it to be a good idea back then. And quite frankly, things have been so busy in so many other directions that I hadn’t thought much about the theater thing. So, while in the Doctor’s waiting room, I looked them up on the trusty iPhone and sure enough, it’s audition season for them. And they’re doing a Sondheim show. 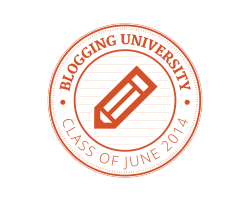 (Squee!) And the auditions were tonight. I’m continuing to practice following signs when Spirit offers them, and this one was offered in such a literal format (I mean, seriously: it was a big wooden sign!) I decided I might as well just leap and do my first musical theater audition in a long stretch of years. To begin with, I’m still in poor voice from this damn cold I’ve been fighting. Then, the sheer spontaneity of the decision (plus last night’s choir commitment plus a thoroughly crazy day at work today) means I didn’t have time to prepare — or even thoughtfully select — a song. I just grabbed my Sondheim book off the shelf and chose a song I knew I still had in the dusty memory banks. As it turns out, the song was just too high to show my voice well. I think that would have been true even if I was in full voice, and with me all scratchy and froggy like tonight? Game over. I’d tried to warm up well in the car on the drive over, but then the time I had to wait sitting in a cold auditorium hallway meant I lost whatever benefit I might have managed from that. And then, yes, I know there was some level where my anxiety grew and I began to psych myself out as the minutes of waiting ticked by, and I saw more and more skinny long-haired bombshells and more and more people greeting one another as members of a club to which I don’t belong. So yeah: I will be damn lucky to get a part in this show. But I have enough backstage experience: vocal director, conductor, stage manager, set design — that I’m pretty sure I’ll get tapped for some thankless behind-the-scenes job. Which, ultimately, is what I was expecting to begin with. If nothing else, the drive home was a fabulous experiment in shutting down the self-critical voice that so much wants to run with the “You don’t belong, you’ll never belong, what were you thinking! ?” script. And, no, I don’t belong to this particular club. Yet. But I might soon. Or, if not, I still belong where I’m meant to. * And oh, by Gaia, does it feel weird to know that the change over to 2015 means that I restarted JALC last spring. How did that happen?!? ** I have a wacky knee thing going on I’ll have to explain some other day. 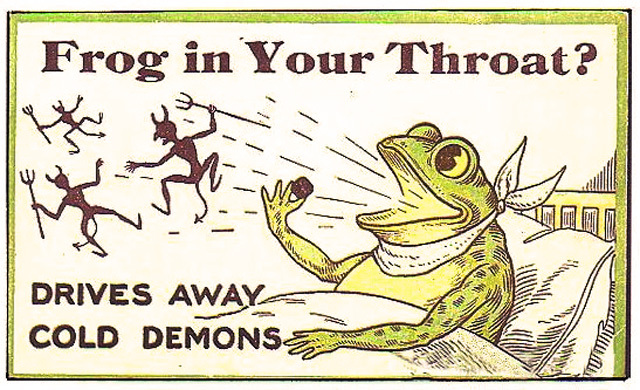 Image credit: Vintage postcard by Frog in Your Throat cold lozenges. Unaltered. Public domain.